Balay da Blas Pensionne House is a 13 room bed & breakfast located in Laoag City, Ilocos Norte province. The property features both traditional and modern Ilocano inspired accommodation suitable for both tourists and business travelers. We first stayed at Balay da Blas back in August 2011 followed by another trip in June 2012 to attend the Empanada Festival in Batac City. We decided to stay in Laoag due to its proximity to the airport and its central location between Pagudpud and Vigan. Balay da Blas Pensionne House is very well managed accommodation in Laoag City. The facilities are well maintained. Our room was clean, the bed was relaxing and comfortable, and the breakfast was amazing. The friendly and hospitable staff also made our stay more enjoyable. These are the main reasons why we consider Balay da Blas as our home in Laoag. Back in 2012, Balay da Blas underwent expansion. The original building houses the traditional Ilocano inspired rooms while a new building that stands adjacent to the original building houses the more modern style rooms. The newer rooms are also designed for visitors looking for affordable but quality accommodation in Laoag. The Standard Double Room is furnished with twin beds, an LCD TV and a split-type air-conditioner. It also has a functional bathroom with hot and cold shower. The highlight of the room assigned to us was a veranda with a view of downtown Laoag. 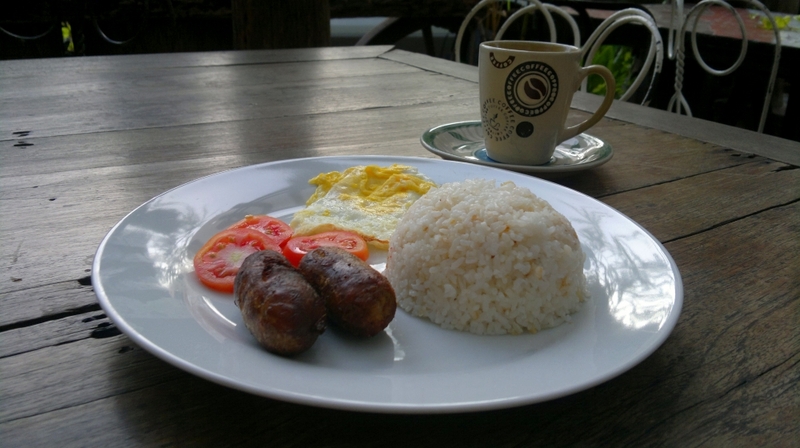 Room rates include Filipino breakfast for every paying guest. We highly recommend their Longanisa Ilocos which perfectly goes with their sukang iloko. Other options include Tinapang Isda, Tocino, Tapa, among others.